Our brief for this stunning project was to modernise and increase the functionality of an old Victorian terrace, to better suit the needs and style of a young modern family. Over the years, renovations during the 1970s, 80s and 90s had masked the beauty of this grand dame. When we stripped back the layers, we discovered that what lay beneath was a stunning original home, worthy of celebration and restoration. We reinstated the original architectural details wherever possible. These details, finishes, fireplaces and sandstone walls became the centrepiece for the overall design. 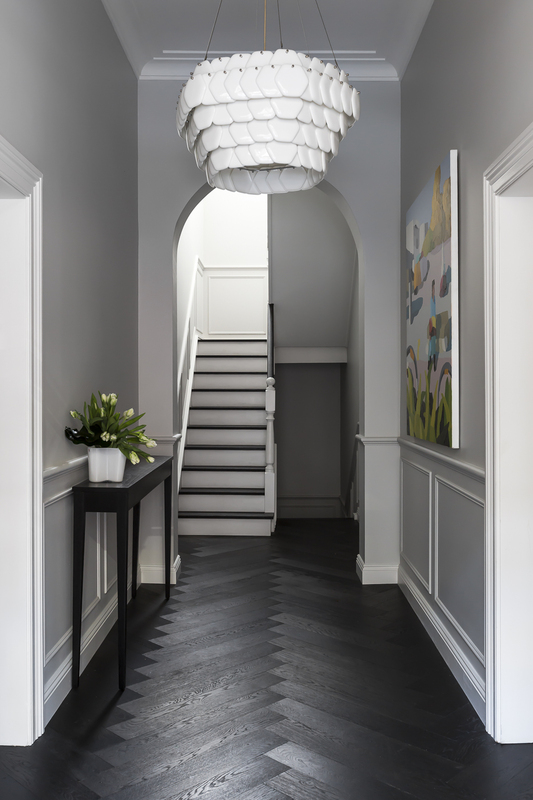 An elegant foyer proudly reveals strong features such as the new herringbone timber flooring, wall paneling and sculptural pendant light. To complement the exposed architectural details, the selection of finishes and textures that we re-instated were considerate of the heritage, allowing for the original sandstone, mouldings and fireplaces to truly become the heart of the home. The sandstone, once revealed and celebrated, became a warm feature adding another layer of texture to the home. Part of the concept to reimagine this home for a young family involved reworking the floor plans. Spaces were re-located and re-appropriated to ensure the home had a practical and functional flow. Engaging all spaces was paramount, allowing every family member space for privacy and connection. The new floor plans enabled us to create a guest wing, au pair quarters, a large rumpus room with bar and kitchenette, as well as a large functional kitchen connected to the family room. Relocating the laundry allowed for an extended master suite with a luxurious walk in robe and an enviable ensuite. We redefined the formal living spaces and the casual living areas, carefully selecting each furnishing element. 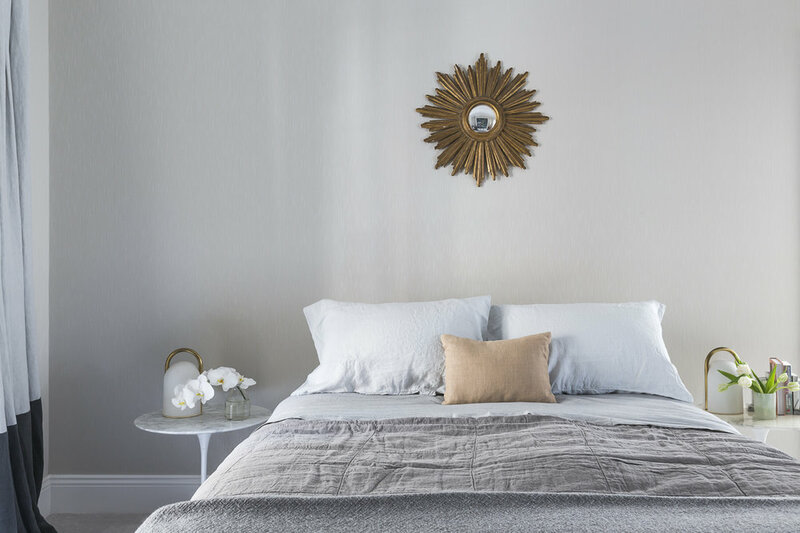 The soft and elegant master bedroom is highlighted by antique pieces, dramatic artwork and gold accessories. Generous wall light fittings complement a simple and yet luxurious master ensuite. Each child has thier own personalised bedroom . . . and the result is absolutely gorgeous!